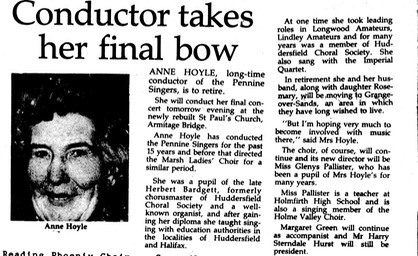 This little article from the May 1990 newletter of the National Association of Choirs gives a tribute to Anne Hoyle on her retirement from the Pennine Singers and move from Huddersfield to Grange-over-Sands. In the right-hand column she said she was "hoping very much to become involved with music there": well, she did, directing The Ghyll Singers for many years! Click here to see Anne Hoyle onstage with us in our photo album.